Posted by Neeta on Jan 8, 2017 in Reviews, Unique Concepts | Comments Off on If You Missing Cassettes, Get Sharetapes and Enjoy! Do you become nostalgic with the memory of cassettes? I become so! But alas! We don’t get cassettes nowadays, neither do we have devices to play them (they stopped working and our family threw them away or sold them in garage sales)! Now in the times of MP3 and DVDs, cassettes are remembered like magical music boxes that played mesmerizing music for us or even our childhood voices reciting poems! If you want to get the same feeling, you can, but with a very tiny-sized device that resembles our dear old cassettes. It’s a Sharetape. “Sharetapes” use a mixture of QR (quick response) codes, music streaming and NFC (near-field communication) technology (YouTube, Spotify, 8Track and Pandora) and can be considered as mixtapes of modern times. They have been given the looks of cassettes (which you will love) and are credit card sized plastic cards in which you can save online playlists from Spotify, YouTube, Soundcloud and more. Then people can play them back on their smartphones by scanning the QR code, or tapping with a NFC-enabled device. 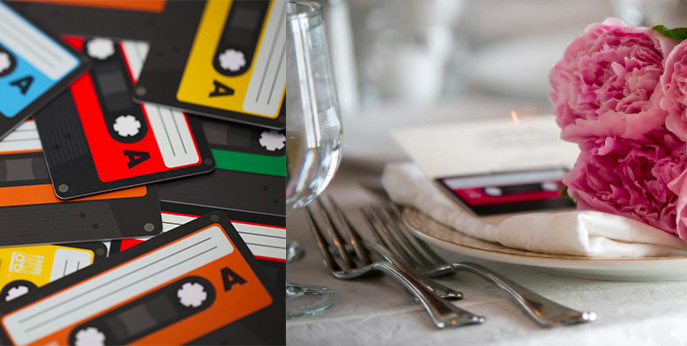 These tiny things are great for sharing music, videos and digital pictures with guests and also as a take home at weddings! They also offer custom printed designs for each event or you can buy blank sharetapes ready to go at sharetapes.com! Sharetapes are the venture of an Australia-based startup. NFC is becoming increasingly commonplace and it has a huge potential to be an essential part of daily life. All of us are tapping our bank cards already at the supermarket checkout against a screen and more latest examples of NFC-enabled products are door locks and business cards that are indicating the pioneering potential of this technology. Each of the Sharetapes has an NFC chip incorporated and a QR code behind for scanning when you want to share your playlist. Sharetapes come in packs of five retro-style cards. You have to register with Sharetapes.com. After that, you can enter a link to your saved playlist from any of the supported websites and also add a unique code which you can find on the backside of each card. Next, hit ‘record’ and your mixtape is created! While NFC support has become quite common on newer Windows, Android and Blackberry phones, it lacks from iPhones and older smartphones; therefore, the QR scanning code has been included. Scanning the code or tapping the card on a smartphone enabled with NFC will take you directly to the saved playlist. If you don’t have either of these technologies, you can go straight to the website Sharetapes.com and input the code and get the playlist. You can even share the website’s name on social media so that all can enjoy your mixtape! Sharetapes can not only be used for entertainment (listening to music). You can also use it for advertising your business to potential customers. For instance, you can use a Sharetape as a business-calling card, laden with links to dynamic, digital content to which you can direct your clients. A budding musician can also create demo albums with Sharetapes. And of course, an established musician can create her/his albums with Sharetapes and publish them for her/his fans to enjoy! Sharetapes are not confined to audio uses – it can be used to curate video playlists too to be sent out. So, this is an amazing way for bands and filmmakers to distribute content. The company offers custom cover art for these artists. So, what are you waiting for? If you missing cassettes, get Sharetapes and enjoy!